As a Fine Arts student in the late seventies, I was criticized for being too decorative, but I couldn’t help the fact that I was drawn to natural subject matter and wanted to create art in a traditional sense. I wanted to acquire skill, to master representational art. This was not the world of art in 1981. A textile design class led me to immediately fall into a world that paid me to paint all day! I had know about the Botanical Illustration certification program offered at NYBG and after a long and wonderful career in design and textiles it was time for a new obsession that was in line with my fascination with the wonders of nature. I just finished reading “The Undressed Art” Why We Draw. A wonderful book that explores human’s compulsion to make a mark on a piece of paper and find meaning in it. It addresses our natural desire to explore, improve and perfect. My art now represents that fascination in my desire to portray the amazing forms and patterns I can relate to as well as the graceful rhythm and movement in nature. I want to share these discoveries with the viewer, to help them see the remarkable details they may otherwise overlook. To see life and growth and find hope and peace in it. I have recently discovered the joy of Plein Air painting and relish learning a new way of expression that feeds my love of nature. I think its important to record the rapidly changing word around us and feel fortunate to paint among so many talented painters chasing the light. My favorite quote comes from Martha Graham: “….There is no artist that is pleased, there is no satisfaction what so ever, at any time. There is only a queer dissatisfaction, a blessed unrest that keeps us marching and makes us more alive….” I embrace that unrest in my quest to discover beauty in the overlooked details of our wonderful natural world. Well said! I can really relate, especially to “I want to share these discoveries with the viewer, to help them see the remarkableness in it that they may otherwise overlook.” So much to discover, so much to draw and share. Thanks! Susan, beautiful! Your work is really lovely. 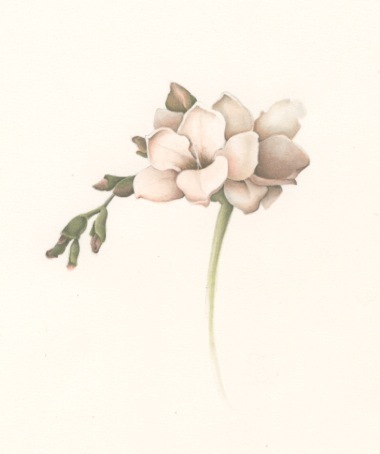 I am always amazed when I find another botanical artist, how like minded we are. You word your “journey back to the joy of making art” so well. I look forward to seeing more of your work!